Editor’s Note: Sangomas, or South African traditional healers, carry forward a long history of healing in the Zulu, Swazi, Xhosa and Ndebele traditions of South Africa. Chris Ntombemhlophe Reid, the first white sangoma of the Pondoland region, gave photojournalist Corinna Kern permission to document the practice of training his new students, who are known as thwasas. In this week’s edition of Parallax, Kern gives an account of part of one thwasa’s initiation with Ntombemhlophe Reid. In one of the most beautiful spots in the Eastern Cape, one and a half hours’ walk from the next drivable road, Chris Ntombemhlophe Reid, the first white sangoma of Pondoland, has a homestead and trains the next generation of sangomas. Ntombemhlophe Reid conducts traditional ceremonies and mentors his trainees, who are known as thwasas. I photographed the thwasas’ lifestyle and training, which is focused on humility and self-deprivation. Their routine is shaped by myriad daily rituals that pave their way towards spirituality in order for them to become traditional healers. This photo shows a part of the ceremony during which the prospective sangoma is initiated as a thwasa. Three chickens were anointed with dream medicine and traditional beer and then placed on the thwasa’s head. I had the privilege to capture it from the front, a space that is usually reserved for the sangomas leading the ceremony. 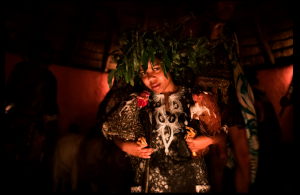 During the ritual, the thwasa closed her eyes while meditating, in order for the chickens to sit still on her head, an indication that the ancestors accepted them as an offering. I took this photo the moment after she passed the test. The ceremony marks the transition phase from the thwasa’s former freedom into a period of self-deprivation that can last up to several years. From then on, the new thwasa will kneel down when speaking, sleep on a thin mat on the ground and wake up every morning before dawn. Documenting this lifestyle was very eye-opening for me.